Make your own battery with this kit. 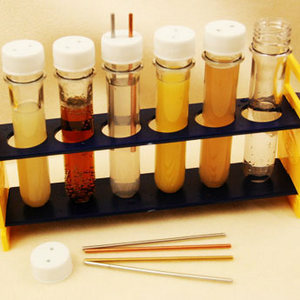 Includes one set of six lidded vials and a stand, one set of metal rods (copper, zinc, aluminum, brass, and steel), and three batteries. Designed for the Everyday Stuff Battery Lab in Unit 1. Introduction to Electricity of the Exploring Physics Curriculum App. The Battery Experiment classroom set for 10 students also available. Digital multimeters are available from several vendors. Vegetables, fruits and liquids not included.